This year, make sure your New Year’s fitness resolution includes your kids. Doing so could make working out and losing weight a lot more fun, according to fitness expert Michael Berry. Berry, Chair of the Health and Exercise Science Department at Wake Forest University, said fitness with the kids must include more than a predictable schedule. You must engage the kids and even make exercise a little unusual to get them excited about working out. 1. See the lights. Around the holidays, there are plenty of interesting light displays to see in your neighborhood. Or walk to pay a holiday visit nearby friends. 2. Aim for two or three activities a week, which will help you reach your daily adult fitness goal of 30 minutes of moderate activity five times a week. 3. Walk to school. That burst of activity in the morning can change your day. 4. Replace pizza and a movie night with family fitness night at least once a month. Get the kids excited about it. 5. Check out the fitness attractions your city offers. Visit a rock-climbing gym or a trampoline place, for example. 6. Make a fitness wish list with the kids. Write down every physical activity they’d like to do, and let them choose at least twice a month. 7. Play like a kid. A half-hour of tag or kickball is good exercise for you and your children. 8. Use your gaming system to your advantage. Pick a high-energy physical activity that you like (Just Dance for Wii, for instance), and make it a family competition. When the kids get bored, change the game. 9. Take it outside. But a simple walk won’t cut it, Berry said. Go to a park or nature preserve and take a hike. 10. Make dining out or after-dinner treats a physical activity. Walk to the restaurant from your home, if possible. 11. Join a league – kickball, basketball, soccer. They all offer opportunities for you and your kids to have fun getting fit. 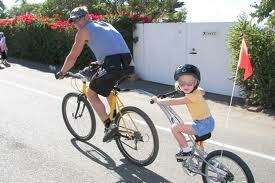 No matter how you decide to get fit with your kids, make sure you keep it safe, Berry said. Drink plenty of water while exercising, follow the rules of the fitness attractions you visit, and keep children’s strength training to low or moderate resistance (like monkey bars). High resistance strength training can lead to injuries. Berry’s profile and research descriptions can be found here: http://www.wfu.edu/hes/berry.htm.